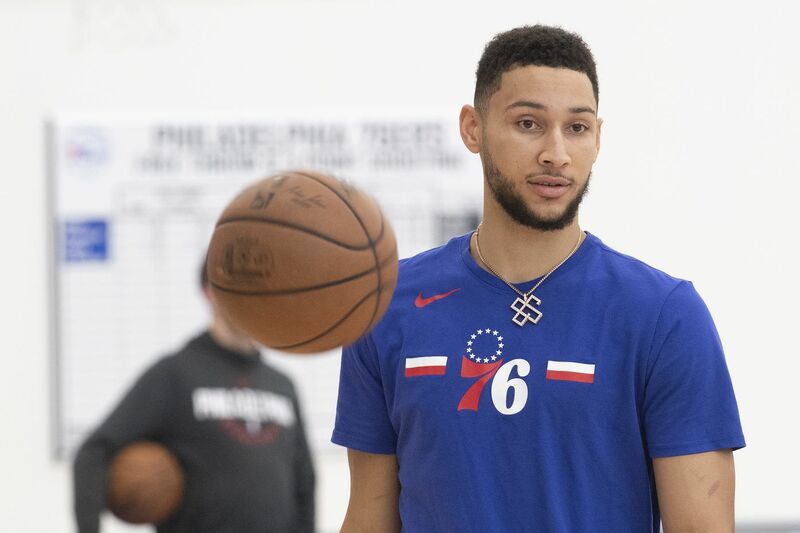 Ben Simmons, after practice on Sunday, said he will be more aggressive in Game 2 versus the Nets. That would help. The opener made that difficult, because there was an awful lot of noise before, during, and after the game. From the owner’s pregame halfhearted shrug of confidence in Brown, to the failure of most of the team’s best players to fight through a bad day, to the sideshow of fifth-string center Amir Johnson, who wasn’t even active, checking his phone on the bench, it was a non-stop noisefest. Of course, it was only one game in a seven-game series against a team that is less talented, so the Sixers are probably going to be OK, particularly if you listen to them. They pointed out that two other higher seeds also lost on Saturday and there are always some surprises in the playoffs, but talent usually makes itself the deciding factor. That is exactly the mind-set to have, although a little less cool detachment when faced with a bedeviling upstart wouldn’t hurt, either. The Sixers take their team personality largely from Ben Simmons and Joel Embiid, and it can sometimes resemble the personality of a team that has already won multiple championships rather than a team that has emerged successfully from exactly one playoff series in the previous six seasons. Acting like you’ve been there before is a good thing, except when you really haven’t. From the Sixers’ perspective, it’s easy to look at Saturday’s result and believe that the offense won’t be that bad again. They made 36 percent of their three-point attempts this season, and 12 percent in the opener. That’s an anomaly, even if the Nets did sell out their defense to smother JJ Redick and Tobias Harris. If they find a way to get the shooters open, or make Brooklyn pay for its perimeter attention with a more punishing post game or mid-range game, the offense will certainly rebound. Even if the percentages simply even out a little, that will happen. Ben Simmons tries to defend Spencer Dinwiddie during Saturday's Game 1. Their issues at the other end of the floor, however, are not as easy to dismiss, and should be a greater cause for concern. Brooklyn’s three on-the-ball penetrators, D’Angelo Russell, Spencer Dinwiddie and Caris LeVert, combined for 67 points and they didn’t do it with mirrors. They did it by speeding past slower defenders, taking advantage of mismatches off switches, and exploiting the Sixers’ choice to effectively defend neither the perimeter nor the post. If the entire idea of modern NBA defense is to force opponents into contested two-point shots – and it is – Saturday was an epic failure. The defensive lapses are often attributed to Redick, somewhat understandably. He can’t keep up, and the Nets were relentless in switching him into poor situations. The problems go deeper than just one guy, though. Any NBA coach can cover up for one player. Aside from Jimmy Butler, Brown found himself needing to cover up for nearly everyone. After practice Sunday, Brown indicated the team learned which switches it will keep and which it will discard for the rest of the series. The logical move is to stick Redick on shooting guard Joe Harris, not switch him at all, and remove him from the game when Harris goes out in favor of one of those greyhounds on the bench. The other edge of the sword is that would mean Redick going under screens to stay on his man and Joe Harris happened to lead the league in three-point percentage. Pick your poison. That is what the Sixers have to do, in several areas. Of course, the Nets will also have difficult decisions to make if Embiid plays himself back into game condition and can run rim-to-rim instead of just rim-to-foul line, and if Simmons stirs himself to view this series as a challenge and not just an imposition. The journey has just begun, and sometimes it is better to begin it by taking a punch rather than delivering one. If nothing else on Saturday, the Sixers succeeded in taking a punch. Now, we’ll find out whether they liked it or not.